These muffins are packed with healthy stuff. Seriously, they are like a mini carrot cake meets zucchini bread meets healthy muffins. You can pump up the sugar if you want, but I was trying to keep these low in points. 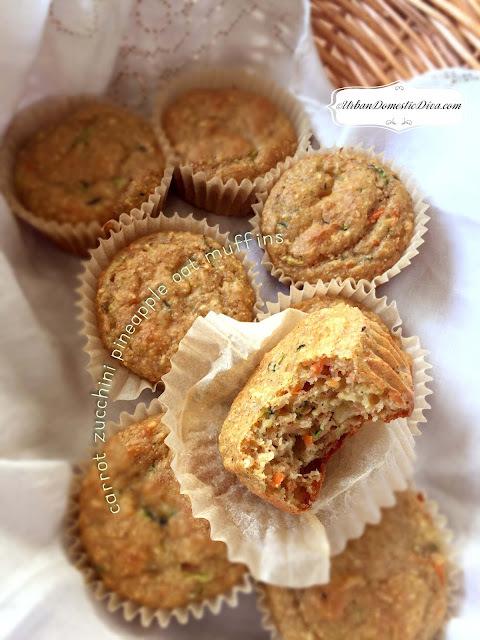 The pineapple and carrots give the muffins a natural sweetness for me, but my family said they needed a boost of sweetenss. If you want something sweeter, double the brown sugar. Let salted zucchini sit in a colander to drain. Squeeze excess water. Preheat oven to 375˚. Line muffin pan with parchment paper. Whisk together the flours, steel cut oats, baking powder, baking soda and spices. In another bowl whisk together the pineapple, yogurt, the brown sugar, the eggs, zucchini and carrots. Let sit for 10 minutes so the oat groats soak up some moisture and soften up. Add the wet to the dry ingredients and stir until just flour is moistened. Fill muffin cups evenly with batter, about two thirds full. Bake until a toothpick inserted comes out clean- about 20 minutes. Let cool in the pan for about five minutes and then remove to let cool completely.